A few weeks ago I was searching for something on the intenets and stumbled up on this recipe for Snickers Dip. Yes, you read that right. A dip made with Snickers. So when I found out that we had some guests in town and Brady said “get some snacks,” I got some snacks…and snickers! This dip was SUPER easy. You basically crumble 6 bars of snickers in your food processer (this looked super gross, but was super fun) and then mix the Snickers and other ingredients in your mixer. EASY, right?! 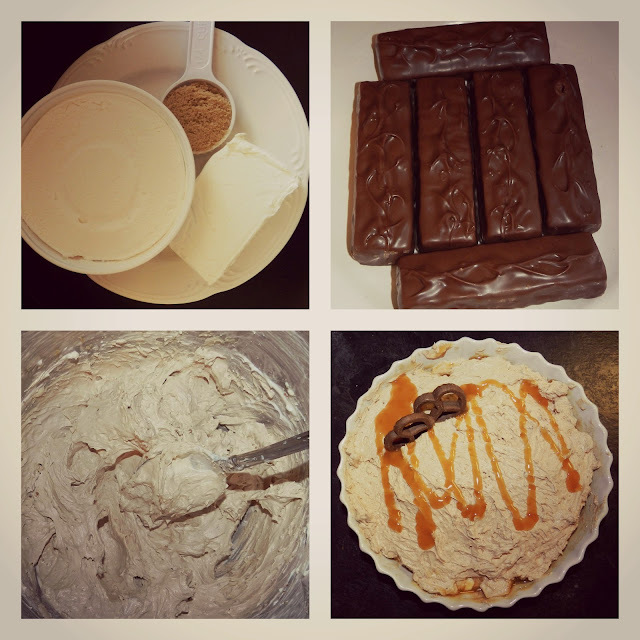 Here is the recipe for Snickers Dip adapted from Culinary Cool. Mix the cream cheese, Cool Whip and brown sugar. Crumble the Snickers in a food processer (note that this is also loud!). Then, mix the Snickers into the cream cheese mixture. Layer the dip mixer in a dish, then drizzle some caramel, then repeat. Serve with pretzels. I picked up some chocolate pretzels, but I think regular ones would be better. Like the Cookie Dough Dip, this is better after is refrigerated for a few hours.